When cars drive themselves, passengers may not care if they ride in a Chevy or a Ford. After a century of building automotive brands based on how they drive, carmakers face an existential threat in the coming age of autonomy. If a customer no longer pilots a vehicle, the marque of its maker may become irrelevant. After all, most people don’t reserve a flight because it’s on a Boeing or an Airbus, so automakers are trying to turn today’s cars into a connected extension of the home or office to keep their names vital. Any diminution of automotive brands would be a seismic shift for the industry. Car companies have derived much of their strength and earnings power from the value of their makes and models. The world’s top 15 automotive brands are worth a combined $256 billion, with Toyota alone valued at $53.6 billion, according to marketing consultant Interbrand. Since the dawn of driving, auto marques have pitched themselves with their mechanical prowess, from Volkswagen’s “Drivers Wanted” slogan to the “Have You Driven a Ford Lately?” tagline and Mazda’s catchy “Zoom, Zoom” campaign. Lately, though, carmakers have pushed built-in technology like Wi-Fi as a selling point. That approach pits them against tech giants Google and Apple Inc., which are accelerating their own research into self-driving cars. When autonomous vehicles begin to hit the road in the next decade, it’s not yet clear that legacy auto brands will take top billing on the hood of those cars, said Mark Short, a global automotive and transportation leader for consultant Ernst & Young. “The biggest question on the table today: Is it going to be a Chevy powered by Apple or is it going to be an Apple vehicle or a Google vehicle?” Short said. Eventually, Ford Motor Co. and other carmakers hope to offer consumers access to all forms of mobility -- driverless cars, robot taxis, trains, bikes and buses -- from the touch of an app that would bear their brands. Initially, though, automakers will promote the comforts that make their self-driving cars stand out. GM President Dan Ammann points to how airlines differentiate themselves with their services and amenities. He cites Singapore Airlines Ltd., which advertises the showers, enclosed passenger compartments and lounges it offers to its first-class flyers. “It will be about connectivity, comfort and all of that,” Ammann said. Connectivity in the car will grow to become a $750 billion business by 2030, according to consulting firm McKinsey & Co. GM is counting on connecting with consumers with a deal with AT&T Inc. to offer Wi-Fi hot spots in cars which builds on the 12 million autos it’s already outfitted with internet connections. GM also developed a partnership with IBM Watson that can mine a car’s data and figure out a driver’s preferences and habits. Using artificial intelligence, a car’s interactive infotainment system will then be able to direct the driver to gas stations, restaurants and other products and services their driving and shopping patterns suggest they need, said Mark Lloyd, GM’s consumer online officer. Earlier today, IBM announced a partnernship with BMW to use Watson to help develop driver-assist technologies. Automakers are already showing concepts of how autonomous cars could be used as a mobile office or a comfy living room on wheels. 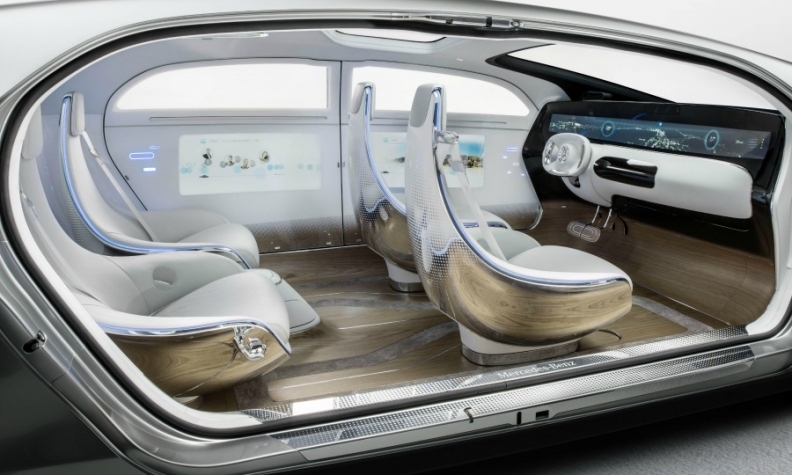 Mercedes-Benz’s F 015 concept features four seats that face each other while the walls of the oval-shaped luxury cruiser are covered with six digital tablets that communicate with the outside world. The idea is to create an experience that could take the role of a short flight, said Michael Hafner, director of driver-assistance systems and active safety for Mercedes. Hakan Samuelsson, CEO of the Volvo Car Group, sees automotive brands heading down two roads in the coming age -- sticking a company’s badge on the nose of robo-taxis as well as on self-driving cars that are privately owned. To that end, Volvo is supplying self-driving cars to Uber Technologies Inc. for a test that the ride-hailing service is running in Pittsburgh. GM and Toyota Motor Corp. also have vehicles in similar tests to get their brands in front of ride-sharing consumers. Volvo plans to take the model it puts in robo-taxi fleets and add features to make it a premium car that it would sell to affluent suburban families. The principal selling point would be a full auto-pilot system, a $10,000 option, that wouldn’t require the driver to take the wheel in an emergency, Samuelsson said. Such a car will be on the road in five years, he said. In the autonomous race, car marques have a key advantage: trust. Luxury and established brands are viewed more favorably by consumers than tech companies, in part because of the safety reputation automotive brands have built up over decades, according to a recent survey by the consultant PricewaterhouseCoopers. Building a trust bridge to the future is an important element of brand-building that has already started. In the meantime, carmakers are trying to figure out what the self-driving car of tomorrow will look like. At GM, designers use cardboard and furniture to mock up future cabins that will keep consumers coming back for their cars. And they rest knowing they have time to figure it out before the robots take over, said chief designer Mike Simcoe.